Using our skills as chemists, we seek to develop new systems for diagnostics and drug delivery using the programmability and biocompatibility of DNA. We are currently working on projects to understand how DNA nanostructures behave in vivo. Utilizing only a minimal set of DNA strands, we build unique 3D structures for uses in applications such as drug delivery and organization of other materials. This strategy allows us to make complex constructs using less DNA than other methods. In the Sleiman lab, we work towards interfacing DNA with many other materials, including organic molecules, metals ions, and inorganic nanomaterials. We want to explore how DNA can be used to modify and organize these moieties. A major research focus in our laboratory is the construction of DNA-based architectures for applications in biology and materials science. Previous methods used only DNA to provide all design features, resulting in DNA-dense structures that are large and rigid. We developed a new approach to DNA construction, in which synthetic molecules control and modify DNA self-assembly (Science 2008, Chem. Soc. Rev. 2011, Nat. Rev. Mater. 2017). We applied this strategy to three-dimensional DNA cages and nanotubes. 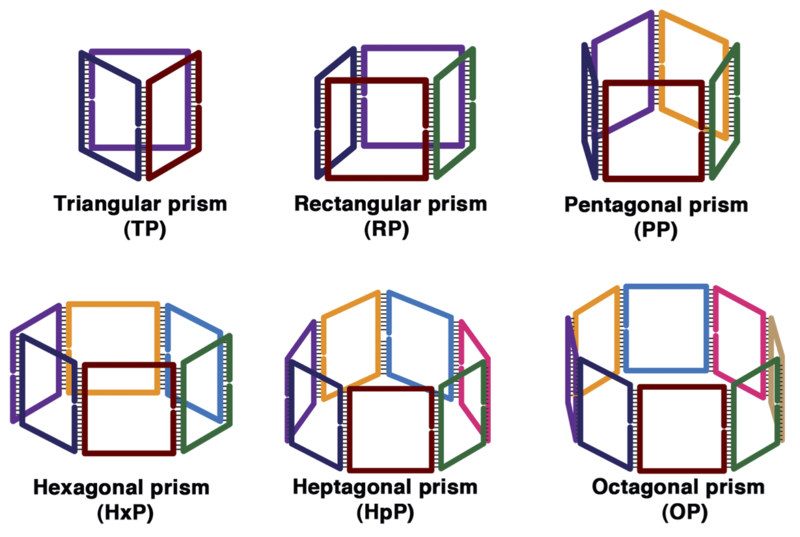 We showed the first modular synthesis of prismatic DNA cages with deliberate variation of size and geometry, and controlled size switching with added DNA strands (JACS 2007, ChemComm. 2011, JACS, 2012). We reported DNA cages (Nat. Chem. 2013) and DNA nanotubes (Nat. Chem. 2015, ACS Nano 2013), where geometry, length (Nat. Commun. 2015) and dynamic character (ACS Nano 2015) could be precisely varied. We then reported a modular approach for the synthesis of DNA nanotubes, with ready control of geometry, size and stiffness of these assemblies, and ability to generate these in single-stranded ‘open’, and double-stranded ‘closed’ forms (Nat. Nanotech. 2009). We showed the encapsulation and selective release of cargo within our DNA cages (Nat. Chem. 2010, Nat. Chem 2013) and the control of nanotube length (JACS 2010, Nat. Chem. 2015). These cages can be reversibly anchored on lipid bilayers (JACS 2014). Intriguingly, despite their negative charge, DNA cages can penetrate biological cells (JACS 2012), silence gene expression (Biomacromol. 2014, Nanoscale, 2015), are stable in bodily fluids (Chem. Comm. 2013) and selectively bind to serum proteins to improve in vivo distribution (JACS 2017). 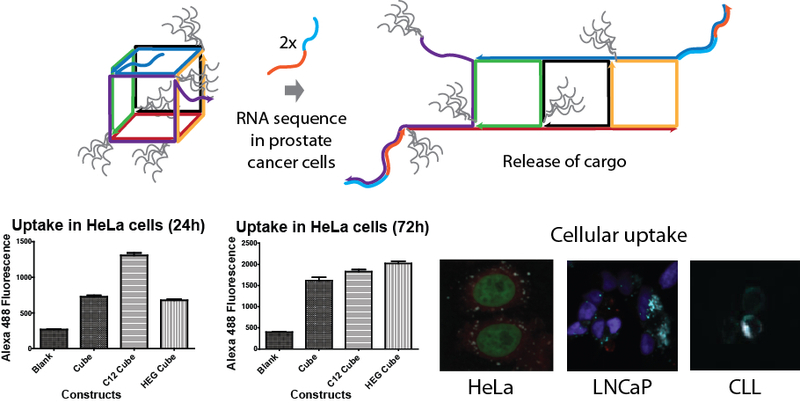 This allowed the design of a DNA cage that stays closed until it encounters a molecule that is only present in prostate cancer cells; this cancer-specific molecule acts as a “key” to unzip, open the DNA cage (Chem. Sci. 2014) and release the drug cargo (JACS 2016). This is an important proof-of-concept for the ability of these cages to act as targeted drug delivery vehicles. The DNA alphabet (A, T, G and C) is the underlying code that gives rise to the double helix structure. Scientists would like to develop a larger, designer alphabet of DNA bases to create more varied DNA structures. This goal, however, requires costly and complex synthetic procedures. We discovered that when cyanuric acid, an inexpensive small molecule, is added to DNA strands, it coaxes them to assemble into a completely new structure: a triple helix that grows into long fibers, with the bases organized in a hexagonal rosette structure. This simple, inexpensive way to expand the DNA alphabet into a new material can be potentially applied for tissue regeneration and materials science. (Nat. Chem. 2016). We recently made an exciting discovery: DNA structures can be used not as permanent scaffolds, but as a temporary “printing press” to create programmable materials. The binding information contained in these structures can be transferred onto gold nanoparticles that then become just as programmable as the original structure. The DNA “printing press” can then be re-used, significantly reducing fabrication costs. This introduces the fundamental notion that supramolecular information can be transmitted from one material to another through a chemical process (Nat. Chem. 2016). 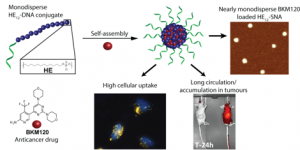 We have now applied the concept of “DNA printing” to synthetic polymers as a method to encode DNA’s structural programmability in polymer self-assembly (Nat. Chem. 2018). Sequence-defined polymers are macromolecules in which the monomer units are arranged in a specific order along the chain. This sequence regulation plays a fundamental role in structural control and molecular recognition for biopolymers, such as DNA and proteins. Non-biological synthesis of these polymers is however challenging. We generated a new class of polymers which are monodisperse and sequence-controlled, by adapting the tools of automated solid-phase DNA synthesis to artificial monomers. The sequence order of monomer units in these new materials plays a major role in determining their self-assembly, their ability for encapsulation and biological properties. (Angew. Chem. 2014, Cover Page, ‘Very Important Paper’, Polym. Chem. 2016, J. Org. Chem., 2018). Their assembly results in spherical nucleic acids, which template chemical reactions (Chem. Comm. 2016) and can efficiently silence gene expression (Nanoscale, 2015). They have favourable in vivo biodistribution and were used as delivery vehicles for antitumor therapeutics, that re-sensitize cancer cells to chemotherapy (Chem. Sci. 2017). In collaboration with the Cosa group at McGill University, we have also started working on developing single molecule imaging methodologies to better understand the dynamics of DNA nanostructures, in particular, nanotubes. This collaboration has also resulted in a publication on the cover of Nature Chemistry about the solid-phase synthesis of perfectly monodisperse DNA nanotubes.